Spicy cured pork sausage flavoured with smoked paprika, cayenne pepper and garlic. Pork, Flavouring, Salt, Smoked Paprika (2%), Dextrose, Garlic (0.2%), Cayenne Pepper (0.2%), Antioxidant (Sodium Ascorbate), Preservatives (Sodium Nitrite, Potassium Nitrate), Nutmeg, Oregano. 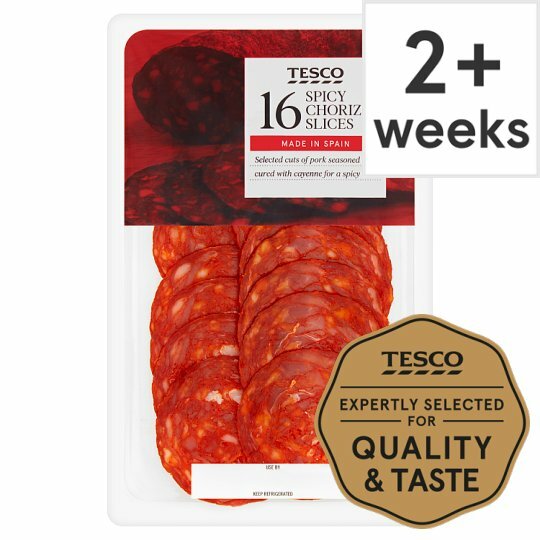 Prepared from 123g of Pork per 100g of Chorizo.